I usually try things I don’t care for, a little bit here, a little bit there, trying to figure out the flavors and what bothers me about them. I often succeed in ‘exorcising’ my demons. Anchovies were tough, but I am making progress. Same for nori, I’m almost at the point of really enjoying that briny taste. Nori never gave me any hint of “brininess” and I could eat it straight if I had to … not that you’d want to, of course. 🙂 But, the very thought of putting an olive in my mouth just gives me the creeps! What a scrumptious meal! 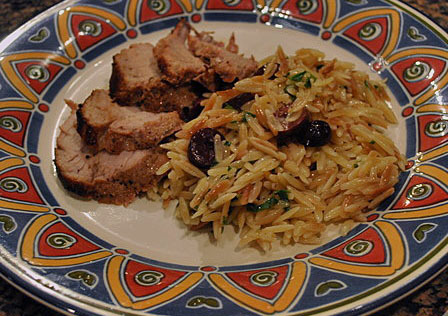 The pork must taste wonderful and the orzo looks wonderful. I love the lime in this recipe. That sounds so good – and fresh. Looks like a good everyday meal to me. 🙂 We’re always in need of those! Orzo and couscous are two staples we always use on our weeknight meals, as they cook so fast. White rice too, although these days I am more fond of brown rice. Looks like a great meal. I love orzo and don’t use it enough. Also, we love brown rice, but since it takes longer to cook we make extra. You would think that Sally, the planner, the compulsive list maker would consider making a large batch to enjoy at a later day, right? You can make a full rice-cooker full and freeze portions in food-saver bags. Works for farro and beans too. I love the idea of an everyday meal and the choice of seasonings for the pork – soy, ginger and lime – are delightful. 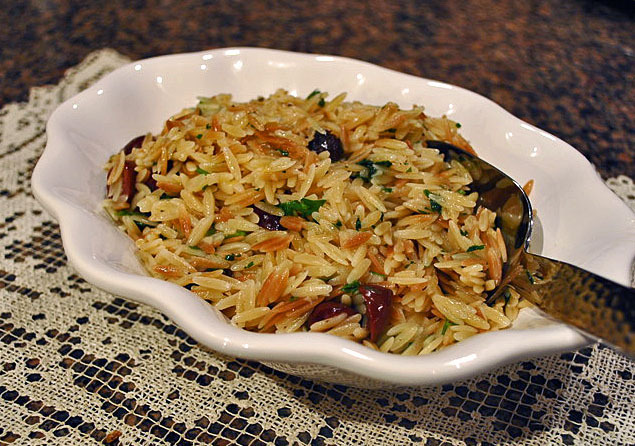 The toasted orzo looks amazing Sally… I have to try it! by the way, I made your lemony pancakes with chia seeds, they were great! my photos didn t turn out good, though…. I will definitely be repeating them in the near future, great recipe! Sally, I have those days too when I’m just not sure what I want to make and up pops inspiration! Turns an “every” day into a great day!! Love that orzo with the lemons and olives!! those days are tricky, make me feel bad about the 100 cookbooks on my shelves! Looks good! I think those recipes from Everyday Food are usually quite reliable. indeed, only one recioe I tried last year was a complete failure…. I love pork tenderloin but I’ve never cooked it like this before. I’m definitely going to try it soon. my favorite method by far! Easy to remember the timing…. I have not heard of this method for orzo — I usually buy it to make pasta salad with. Orzo salad is great too, haven t made it in a while….